MAKOplasty Robotic Arm Total Hip Arthroplasty-It's Time to Live Again! MAKOplasty® Total Hip Arthroplasty is indicated for patients who suffer from non-inflammatory or inflammatory degenerative joint disease. 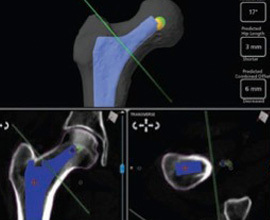 It is powered by the RIO® Robotic Interactive Arm Orthopaedic System, which allows surgeons to achieve a new level of precision with the newest techniques in hip replacement surgery. MAKOplasty® Hip is designed to restore patient mobility and an active lifestyle. The hip is one of your body’s largest weight-bearing joints. The hip is called a ball-and-socket joint because the spherical head of the thighbone (femur) moves inside the cup-shaped hollow socket (acetabulum) of the pelvis. These bones are covered by cartilage, a layer of strong tissue that cushions the bones and allows smooth, easy movement of the joint. Degenerative joint disease (DJD) can cause a loss of cartilage, resulting in bone-on-bone contact that may result in pain, swelling, and stiffness. There are different types of DJD that may cause hip pain. What is degenerative joint disease (DJD) of the hip? Osteoarthritis (OA): also called “wear-and-tear arthritis,” in which the cartilage wears down over time. Post-traumatic arthritis: which results from a severe fracture or dislocation of the hip. Rheumatoid arthritis (RA): an inflammatory arthritis of the joints. Avascular necrosis (AVN): a condition where the “ball” or femoral head has lost a healthy supply of blood flow causing the bone to die and the femoral head to become misshapen. Hip dysplasia: a developmental deformation or misalignment of the hip joint. If you are one of the millions of Americans suffering with hip pain from degenerative joint disease, you may be a candidate for MAKOplasty® total hip arthroplasty, also known as MAKOplasty® total hip replacement. What is MAKOplasty Total Hip Replacement? MAKOplasty® is an innovative, breakthrough solution for those suffering with painful DJD of the hip and need a total hip replacement. MAKOplasty®, powered by the RIO® Robotic Arm Interactive Orthopaedic System, allows your surgeon to treat your specific hip condition with accuracy and precision. If your surgeon determines that you are a good candidate for the MAKOplasty® procedure, prior to your surgery date you will have a hip CT scan performed. This is used to create a 3-D model of your hip, pelvis and femur. 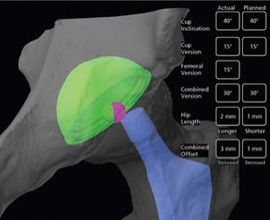 The surgeon uses the RIO® software with information from the model to plan your surgery based on your unique anatomy. During surgery, the software provides real-time information to optimize implant positioning and alignment, and the robotic arm is used to prepare your socket and guide accurate placement of the implants. What are the potential benefits with MAKOplasty® robotic arm assisted hip replacement? Accurate placement and alignment of implant components are a critical factor in hip replacement. MAKOplasty® Total Hip Arthroplasty (THA) is powered by the RIO® Robotic Arm Interactive Orthopaedic System and provides a new level of accuracy and precision in total hip replacement. 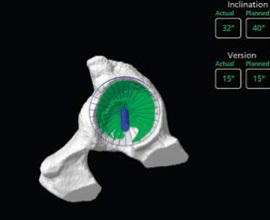 The RIO® System software uses patient-specific anatomic information from a pre-operative CT scan to enable the accurate position of the implants so that the likelihood of implant or bony impingement is reduced as well as a possible reduction in the rate of dislocation. The RIO® System allows the surgeon to know and control the position of the cup and stem in addition to the final correction of leg length accomplished by the hip replacement before closing the incision. Who is a good candidate for the MAKOplasty® total hip procedure? If you have one or more of the following symptoms, talk to your doctor – you may be a candidate for MAKOplasty®. Be sure to discuss all treatment options with your doctor.